Walgreen was the only dividend raiser last week, which is not surprising during the slow summer season. Walgreen, which operates the largest chain of drugstores in the United States, raised its dividend by 22.2% to 13.75 cents/share. The company is a member of the elite dividend aristocrats index, and has increased its quarterly dividends for 34 consecutive years. This is certainly a bullish statement, especially in a market environment where companies are slashing dividends across the board in an effort to conserve cash. Even more bullish is the fact that the company has managed to raise its distributions by an average compound rate of 15% over the past decade. This translates into the dividend payment doubling every 5 years. $1000 invested in Walgreen 20 years ago would have generated only $17.70 in dividend income in 1990. By 2009 this investment would be generating an annual yield on cost of 18.80%. That’s truly great news, except for the small dividend yield that the company currently boast as well as the low dividend payout ratio. Walgreen has only paid out somewhere between 14% and 21% of its earnings as dividends over the past decade. The dividend yield on based on the new quarterly distribution is 1.91%. I was amazed by the outstanding dividend growth at Walgreen and even considered making an exception with my minimum entry requirement of 3%, just to get a piece of this company. The stock is changing hands at the same levels it was trading in 1999, despite the solid dividend growth. Earnings have risen by an average of 13.4% over the past decade. 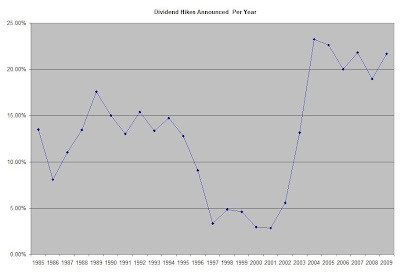 As I dug deeper however, I noticed that the company managed to quadruple its dividend payment over the past decade simply because it wasn’t paying enough to begin with in 1999. The dividend yield was 0.5%, which even after 10 years of above average dividend growth translates into an annual yield on cost of 2%. 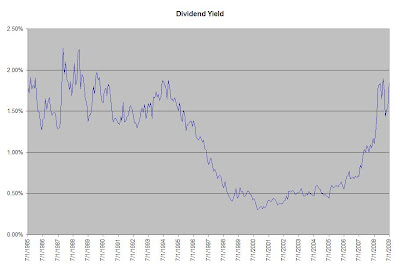 The dividend yield was very low between 1998 and 2006. In addition to that, the company seemed to have slowed down its dividend hikes between 1997 and 2002 to somewhere close to the historical rate of inflation. It seems that the dividend growth is not as consistent as I would like it to be. The low dividend yield does not compensate for the risk of slowdown in future dividend growth. The P/E multiple is attractive at 15 times forward 2009 earnings. Thus I would only consider initiating a position in Walgreen on dips below $18.50. If the stock drops to $25 and premiums increase I would consider selling longer dated covered puts at strikes $20 or $17.50.